KUALA LUMPUR (Oct 20): DiGi.Com Bhd reported a 9% rise in third quarter net profit from a year earlier, helped by Internet revenue growth and a larger subscriber base. In a statement to the exchange today, mobile telecommunication network provider DiGi said net profit rose to RM486.92 million in the third quarter ended September 30, 2014 (3QFY14) from RM448.71 million previously. Revenue climbed to RM1.76 billion from RM1.7 billion. Service revenue growth for the quarter was supported by increased usage from Internet and the Raya festive season, alongside a larger subscriber base, although growth was partly subdued by increased competition, it said. "Internet revenue surged 40.3% y-o-y and 9.8% q-o-q, contributed by increased Internet usage on stronger data network," DiGi said. According to DiGi, its subscriber base rose 4.8% on year to 11.3 million during 3QFY14. 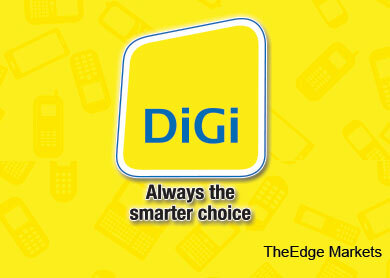 DiGi's cumulative nine-month net profit increased to RM1.47 billion from RM1.16 billion a year earlier. Revenue was higher at RM5.23 billion versus RM5 billion. For 3QFY14, DiGi plans to pay a tax-free dividend of 6.2 sen a share. Looking ahead, DiGi said it was mindful of increasing competition in the telecommunications sector. Hence, DiGi's planned expansion of its high-speed Internet services is deemed crucial to remain competitive in the telecommunication sector. "With market competition likely to continue, DiGi aims to further strengthen its capabilities to compete and defend its position sustainably. It will also focus on excellent execution of planned strategies and will continuously focus on operational efficiency. "DiGi is committed to invest up to RM900 million in capex (capital expenditure) to secure competitive infrastructure capabilities, including expansion of its high-speed data coverage to 86%.